There are only five more weeks, and the contenders are separating effectively away from the pretenders. Week 12 in the World Series of Handicapping contest was a mixed bag with several really bad beats, as well as some games that the house lost their arses on, which is always fun to watch. Some games were predictable as usual, and the field on the consensus picks is still in the 60% range. Thanksgiving week is traditionally hard to call because 6 teams are playing on a short week, and the FIELD was 0-3 in how they were leaning on the Thursday’s game. This is precisely why I only consider Sunday’s games. NFL picks are tough on a short week, avoid Thursday games, and feel free to store that tid-bit of knowledge in the old vault for next year. All in all our contest came out decent with a bunch of 6-1 results as well as prized 7-0 result… so let’s hand out props. 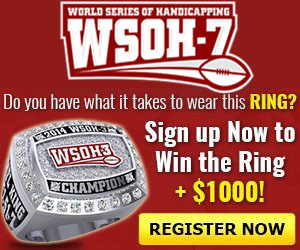 Special props to WSOH member EaglesEye who is now $50 richer after nailing a perfect week. Traditionally contest participants are attracted to the individual game lines and are more comfortable playing their angles against the spread. True or not, the numbers show that’s how people play. Personally I tend to agree, and I prefer to play games against the spread versus over/under. I will say this week, that I felt like Vegas was spot on with their individual game lines and I leaned more towards the over/under lines this week. EaglesEye clearly felt the same way – taking a shot at four over/under lines while only checking in on three games against the spread. I love the ballsy move, and though EaglesEye has no shot at the overall prize they took a risk and won a week which is difficult to do. Well Done!! In fact the top two point scorers for the week each chose 4 over/under games, and more people seemed to go that route then in any week this season. I love how our league didn’t get suckered in by the Tampa Bay/49ers 55 point over/under line. Any fool knows both those offenses are faux offenses and not capable of putting up points like that, even against BAD defenses. My main gamer Fred14 still finds themselves at the top of the standings with a total of 83.10 points, which is more than 15 points ahead of league fave PunchFaceJenkins. I believe 15 points can evaporate in one week… but everyone else will need multiple weeks to narrow this gap and overtake fast Freddy. If you are more than 30 points out, good luck, you can choose to stay conservative and finish with a formidable spot in the standings, OR you can take monster risks and face minimal rewards while plummeting further down in the standings. This no-mans land that you find yourself in is NOT an envious position. I’m in 14th place – and I’m going to go with a medium conservatism strategy tis week. If I can’t narrow the GAP by 10 points, than weeks 14-17 will be high risk high reward weeks. That’s just me… if you think you have a shot, get back to work. See you at the end of the week GAMERS! !